8. As Hong Kong's economy becomes more service-based, North Lantau would be important in strengthening the main economic pillars of tourism and logistics developments. Given the proximity to the airport, good transport connections, anchorage of a world class theme park and scenic natural setting, Lantau possesses unique potential for a greater variety of tourist attractions. To strengthen Hong Kong's position as Asia's premier transportation and logistics hub, the Chief Executive announced in the 2003 Policy Address that a site would be identified in North Lantau to build a modern logistics park. 9. In parallel, the Hong Kong - Zhuhai - Macao Bridge (HZMB), a direct land transport link between Hong Kong and the Pearl River West, has been proposed. Northwest Lantau has been identified as the most suitable location for the landing of the HZMB in Hong Kong. In accordance with State Council's approval, the governments of Hong Kong, Guangdong and Macao in August 2003 set up the HZMB Advance Work Co-ordination Group to take forward the advance planning work for the HZMB. The Co-ordination Group is conducting a feasibility study for the HZMB which is expected to complete by end 2004. The HKSAR Government is undertaking an Investigation and Preliminary Design Study on the Hong Kong Section of the HZMB and its connection with the North Lantau Highway for completion by end 2004. 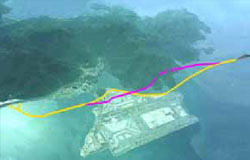 The HZMB would greatly benefit the development of Lantau.